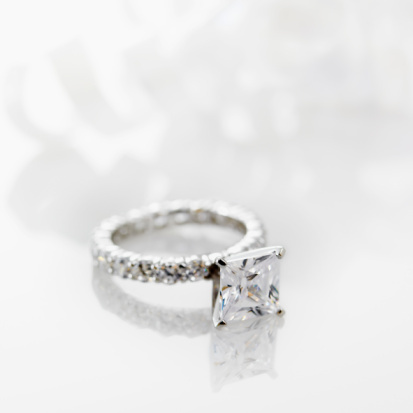 Look into her eyes, hold her elegant finger and slide on this exquisitely crafted diamond ring. A beautiful diamond engagement ring that is sure to draw all the best wishes in the world to your most loved one. Discreetly opulent, this diamond engagement ring displays the diamond’s unique cut, performed by fingers of a master craftsman. Ensconced in a ethereal setting, the set of prongs that hold the diamond form an intricate design. The unique cut of this beautiful diamond is accentuated by a single row of glittering sidestones on the 18K gold band. You will be appreciated for your excellent taste in choosing this Diamond Engagement Ring! Oh, how she deserves it!